A natural born artist, Sally is one of those ‘scary’ people that can do everything. 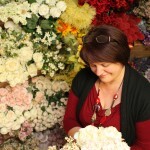 From painting, dressmaking, pottery, musical instruments, floral design and drawing, there isn’t much Sally can’t do. With an incredible mind for visualizing and a perfect eye for colour, Sally is a unique individual working in an industry she loves. 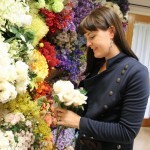 A contemporary floral designer, Maria has very close links to current trends in all aspects of floral design and wedding planning. Her more modern approach leads to particularly glamorous designs with very unique accents. 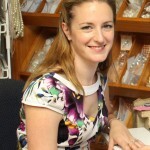 With an additional background in jewellery and wedding accessories, she has a keen eye for detail and a thorough knowledge of what today’s brides are looking for an excellent person to speak to for help to organize any aspect of your big day with absolute ease and confidence. Jana has a beautiful eye for ‘old world’ elegance and extravagance. Her traditional style adds an authentic bridal elegance to many of the designs particularly those with a vintage flavor. With an undeniable flair for bringing together the most unusual flowers in beautiful ways, Jana’s designs are simply classy in every way.